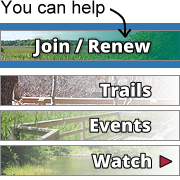 Click here to join our free e-newsletter and receive advance emails about this and other special events. Mission Wolf returned to the Cape on its “wolf bus” for live wolf programs in the fall of 2014. The bus wasn’t a greyhound, but instead was a burly US Marine Corps bus retrofitted to accommodate three wolves as well as Kent and his wife Tracy Weber, the presenters. For the past five years, the Harwich Conservation Trust (HCT) has hosted the live wolf program that travels around the country to share the history, behavior, recovery and mystery of wild wolves. The event is sponsored by The Cape Codder, Harwich Oracle, The Register, The Cape Cod Chronicle, The Cape Cod Times and White Marlie. Kent Weber rescued his first wild wolf from captivity in 1984. Weber was raised in the mountains of northern Idaho and in his travels saw many wild wolves locked up in cages. They were byproducts of the entertainment industry and the misguided notion that a wolf makes a good pet. “I saw more wolves in cages than in the wild, which was appalling. Most wolves in captivity die within 2 years,” says Weber. In 1988, he secured federal and state licenses to open the nonprofit Mission Wolf Sanctuary in the Sangre de Cristo Mountains of the southern Colorado Rockies. More than two decades later, the sanctuary encompasses 50 acres that allow up to 40 rescued wolves and wolf-dog mixes to live out their natural lives. Every year, the Webers hit the road with “wolf ambassadors” that provide people with a rare opportunity to see these magnificent animals up-close. Magpie was ten years old in October 2012 and arrived at Mission Wolf with her sister, Raven, when just a pup. She was part of a litter that was produced for a movie project. When the handler wanted only male wolves for the movie, a home was found at Mission Wolf for Magpie and Raven. 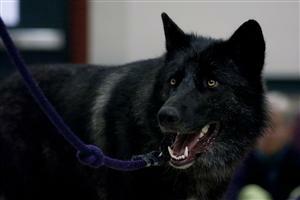 Zeab was 2-1/2 as of October 2012, just becoming an adult as wolves mature at 2 years. He comes from a wolf breeding facility in Florida that found themselves with more wolves than they could handle and appealed to Mission Wolf to take in Zeab and his sister. Abraham was 6 years old in October 2012 and was found dumpster diving in Salt Lake City, Utah when he was still a puppy. Though his origin is not known, it’s obvious that he’s part wolf and part husky. Shelters will not adopt out wolf hybrids and instead, put them down. Luckily for Abraham, his rescuer knew about Mission Wolf. Abraham has a sunny, outgoing personality, which appeals to Magpie and she welcomed him as a traveling companion and fellow program ambassador. It’s always an adventure with the wolves. When the wolves enter the gym and survey the crowd, people are awestruck. Maybe its Magpie’s yellow irises, maybe its something primal. Many come back to see the wolves every year. “This unique event gives folks a rare chance to see wolves up close and raises funds to help the Harwich Conservation Trust save local wildlife habitat. People treasure the experience,” says Lach. 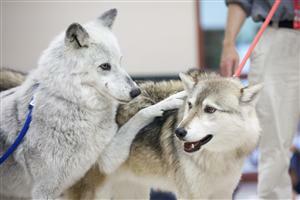 “Since we’ve started the program, we’ve seen the return of about 4,000 wolves to 12 states. It will be a long time before wolves naturally come back to the Cape,” says Weber. At least for now, the wolves will come and go by bus, leaving life-long impressions. 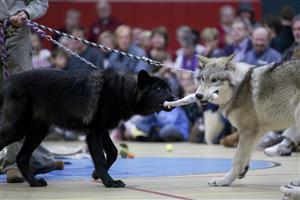 Stay tuned as HCT hopes to host Mission Wolf again the next time they visit the Northeast.